Ira S. Harding began working in Seattle as a contractor in 1912. Married to Lottie M. Harding, he lived at 1507 Harvard St. By 1913, when David C. Keeney had commissioned Harding to build his new laundry plant on Bell St, the Harding family had moved to 2227 10th Ave N.
Harding became known as an architect-builder of specialized industrial buildings. His Seattle Empire plant was praised in laundry trade journals and, during the mid-'20s, Harding designed two additions to bring the Metropolitan Laundry up to date. The Metropolitan is now the "landmark" New Richmond Laundry, whose distinctive architecture was cannibalised in 2005 by architects NBBJ, in order to make it their offices. Built by the well-known architect Max Umbrecht, it was owned by one of Seattle's most-respected laundrymen, W.H. Weaver. At right, another Harding building on Western and Vine streets (seen when it was upscale lofts), now houses offices and condominiums topped by a two-story, wrinkle-tin "penthouse". Harding was involved not only with the Seattle building trade but also with his brood of children. Howard D. Harding (pictured at left) was the son born to Ira and Lottie in 1912. He would gain celebrity as a musical prodigy. The same year that the Seattle Empire Laundry opened, a toddling Howard D. made his public singing debut. This was rapidly followed with appearances at the city's Colonial Theater and on Seattle's first-ever radio station. Howard D. attended the University of Washington, then leapt into show business as a publicist for the Ice Follies. Soon he was the featured soloist and emcee for their spinoff organization, the San Francisco-based Ice Cycles. Harding appeared regularly on national radio shows, toured the world with orchestras - even cut records and played on Broadway. After a World War II career of maritime service and concerts, Harding moved to California.But he returned frequently to visit his parents and his two Seattle-based sisters, occasions almost always highlighted in the press. On these visits, he appeared at many charity benefits and Ira Harding gave receptions in his honor. Ira S. Harding was a versatile architect who built functional family dwellings as well as a power laundry. But his most memorable buildings in Seattle are industrial structures, three of which still survive today. In an ironic parallel to his son's artistic career, at one point all of Ira's surviving buildings were used for artists' housing. 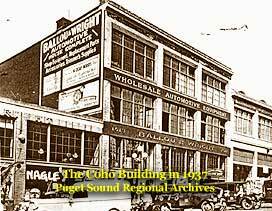 By 2000, however, this was no longer the case - the only Harding building serving artists was 1513 12th Ave, or the "Coho Building".  Both his Seattle Empire Laundry and 2318 Western ("81 Vine St") have been substantially altered. Above left: Built the same year the Seattle Empire opened for business, Harding designed these premises just down the street at 2518 Western Ave as a box factory. By the time of this WPA survey photo, they were owned by the Frayn Printing Company. 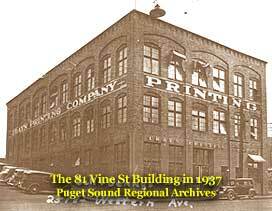 Like Seattle Empire, the factory was steam-powered and boasted solid concrete walls to its second floor level. Above right: These large, three-story premises have a reinforced concrete exterior and two interior concrete partitions topped by a terra cotta cornice. They were designed and built by Harding in 1917 on land he himself owned and were first used by a taxidermist. In 1919, the building was purchased by automotive specialists Ballou & Wright who, in 1927, commissioned Harding to design the single-story building seen at left. Both buildings had their own steam power, which was run out of full-size basements.